Figures from the realms of myth, fiction and history were central in genealogies of ruling dynasties the medieval literary tradition. These legendary characters played an enduring role in kingship and other structures of society. Professor Ruairí Ó hUIGINN is Director of the School of Celtic Studies at Dublin Institute for Advanced Studies, and taught at Maynooth University for many years. Thurs 21 Feb – Dawn of the Greek Gods: Cosmos and Chaos – Hesiod’s Theogeny and the First Philosophers –tracing the mythic roots of western culture and the ongoing inspiration of poetic literature of the 8th century BCE. Join us for this special illustrated presentation! 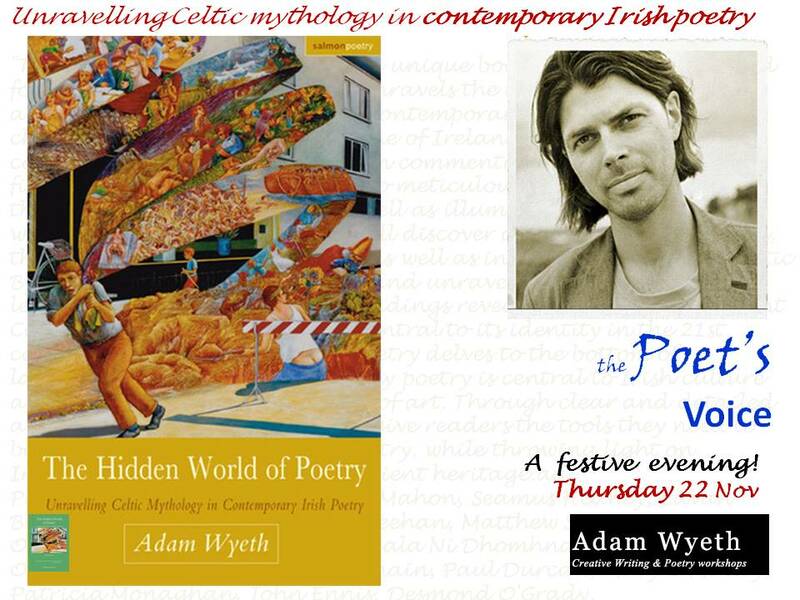 Adam will talk and read from his book “The Hidden World of Poetry: Unravelling Celtic Mythology in Contemporary Irish Poetry” (2013), which contains poems from Ireland’s leading poets followed by sharp essays that unpack each poem and explore its Celtic mythological references. ADAM WYETH is an award-winning POET, PLAYWRIGHT and essayist. His critically acclaimed debut collection, Silent Music (2011) was Highly Commended by the Forward Poetry Prize. His second poetry collection The Art of Dying (2016 ) was named as an Irish Times Book of the Year. THEATRE AND FILM – Adam’s plays have had productions in Ireland, Berlin and New York. FACILITATOR , LITERARY READER AND EDITOR- Creative Writing at Fishpublishing.com, workshops on “The Mythic Imagination”. This is a Mythic Links event!